Freedom of Information or access to information (ATI) - also known as the public's right to know or administrative transparency - gives citizens access to official information hold by government and other public authorities. In 1766 a Freedom of Information Law (Tryckfrihetsförordningen) was introduced in Sweden-Finland, thanks to a Finn named Anders Chydenius, who (inspired of 7th century China) fought for democracy, equality, and respect for the human rights. 1888 followed Columbia, 1919 in constitution and 1951 law in Finland (independent 1917) and 1966 in USA. Since then more than 100 countries adopted such laws. Many countries guarantee FOI in constitutions. More thens 125 states with more then 5.9 billion inhabitants adopted FOI laws or provisions in constitutions. ATI is now firmly recognised as an internationally guaranteed human right, with decisions at the Inter-American Court of Human Rights and European Court of Human Rights, and global recognition by the UN Human Rights Committee. All countries in Europe have FOI laws or are preparing bills. Nearly all OECD countries and all developed countries recognize Freedom of information. Right2Info.org gives an overview. RTI-Rating.org rates laws according to international standards. Transparency was the Word of the Year 2003 and 28. September 2003 was the first "Right to Know" Day. 09. April 2014: Constitutional Complaint 1 BvR 897/14: Enforcement of the Human Right of Access to Information in Bavaria/Germany. 26. May 2013: The Call for Innovative and Open Government: How to increase transparency for citizens/customers? 14. May 2013: Baltic Sea NGO Forum and Unesco supported ATI in Germany: What's next? 2. April 2013: Does anyone else have positive experiences with the UN Universal Periodic Review (UPR)? 31. March 2013: Will CoE Support the Human Right of Access to Public Documents? 7. November 2012: Will OSCE Support the Human Right of Access to Public Documents? 4. November 2012: Should GRECO and HRC experts do the job they are paid for? 14. July 2012: Is it Possible to Enforce the Human Right of Access to Information in Bavaria/Germany? 15. February 2012: Will political parties strengthen transparency and anti-corruption? 26. January 2012: What has to be done to improve transparency and fight against corruption in Germany? 5. September 2011: The project ‘Electronic Public Records’ (OEP) won the European Public Sector Award 2011. 16. June 2011: Freedom of information missing in 6th German ICCPR state report. 11. February 2011: Germany asked to remove the human right of access to public documents and other human rights. 01. August 2010: Norway: Ca. 1200 requests per 100 000 inhabitants, i.e. twice as much as in USA (A6 list). 18. February 2010: "Icelandic Modern Media Initiative" with "ultra-modern" Freedom of Information Act. 28. January 2010: My advice to Prime Minister Stoltenberg of Norway. 14. April 2009: ECHR Application no. 37374/05 by TÁSZ against Hungary recognizes access to public documents as human right. 06. February 2008: Germany should Sign and Ratify the Council of Europe Convention on the Access to Official Documents. 02. December 2008: Norwegian Foreign Ministry answers. Summer 2008: When will the last 5 German states adopt FOI laws? 11. August 2008: Letter to Chairman of CoE ministers about Convention on Access to Official Documents. 01. May 2008: Consumer Information Act in force in federation and most states. 15. October 2007: Council of Europe Treaty on Access to Documents. Civil Society Calls for Urgent Action: Draft Convention Fails to Ensure Adequate Protection of Right to Information. 28. June 2007: ECHR application no. 31583/07 on publication of income and sideline job of MPs. 24. April 2007: China finally approaches freedom of information jurisdiction – Decree on release of government information passed. Snell/Xiao: FOI returns to China. 2. January 2007: The Public has a Right to Know why the Consumer Information Law was declared unconstitutional. 21. November 2006: What will the Commissioner for Human Rights report on visiting Germany? 16. October 2006: Justice Initiative Intervenes in ECHR Strasbourg Freedom of Information Case: Application no. 11721/04. GERAGUYN KHORHURD PATGAMAVORAKAN AKUMB v. ARMENIA. 08. August 2006: Realization of Freedom of Information failed in 8 German Federal States. 01. Aug. 2006: Will the International Helsinki Federation for Human Rights (IHF) promote human rights in Germany? Answer. 01. June 2006: Will the EU Network of independent experts on fundamental rights promote human rights in Germany? Funding stopped. 16. May 2006: How much uranium is in mineral water? 3. April 2006: Access Info Europe suggests to give a binding convention for access to information. 01. Jan. 2006: Will the Parliamentary Assembly of Council of Europe promote Freedom of information? Petition transmitted to competent committee. 10. Dec. 2005: Petition EU Parliament: Suggestion to start consultations with German parliaments. 14. Nov. 2005: Human Rights for Citizens and Patients and Securing Freedom of Information in Constitution. 11. Nov. 2005: Complaint to ECHR. 8 March 2006: The Court will deal with the case as soon as possible. 19. Oct. 2005: Complaint to UN Petition team. 07. Sep. 2005: Petition to add access to public information to constitution. 18. Aug. 2005: Will Constitutional Court take International Law and Human Rights into account? 30. July 2005: When will FOI be realized in local states? 08. July 2005: Bundesrat approves FOI law. The Federal Data Protection Commissioner will become also Commissioner for Freedom of Information. 03. June 2005: Parliament Bundestag approved FOI law. Will Senate (Bundesrat) correct this? 01. June 2005: Hillbilly CSU Zeitlmann says FOI law is harmful and unnecessary. 30. June 2005: Defending violations of privacy more important for press then Freedom of information? 11. May 2005: Parliamentary Reading of FOIA cancelled. 14. Mar. 2005: Hearing: German Parliament about a FOI draft law. 15. Dec. 2004: Germany's ruling coalition gets serious about freedom of information. 13. Dec. 2004: Complaint to OSCE (Organization for Security and Co-operation in Europe). Answer. 28. Sep. 2004: Who supports Access to Information for Germany? 06. Nov. 2004: In my opinion Germany must be sentenced: Info to EU Commission. 19. Oct. 2004: It is possible to force access to documents by court case? Question of access is not even admissible. 28. Sep. 2004: What can one expect from international organisations e.g. UN, EU, CoE, OSCE? 02. Mar. 2004:German NGOs publish their own FOI draft law. 27. Feb. 2004: EU directive on FOI for Germany? Liberation from Nazi law on Legal Advice? False report to UN? 21. Dec. 2003: Petition on Human Rights Violations in Germany: Invitation of the Human Rights Commissioner. Survey. 13. Dec. 2003: 68th Anniversary of Nazi Law on Legal Advice. 18. Nov. 2003: Info to Commissioner for Human Rights of the Council of Europe. Answer. 22. Oct. 2003: Germany violates Human rights, but makes false reports. 23. June 2003: Swedish solution for Freedom of Information in Germany? 24. Feb. 2003: Will chancellor Schröder promote Freedom of Information? 17. Jan. 2003: Why failed Freedom of Information in Germany? 23. June 2002: Result: I was enthusiastic one year ago, because Germany had the chance to catch up with the international development. Who is responsible for that this chance was wasted? 29. May 02: Would a web site www.article19.de help? 08.05.02: Will chancellor candidate Stoiber promote Freedom of Information? 06.05.02: Constitutional Complaint: Freedom of Information for Germany. No right to a fair answer. 01.05.02: Mexico Adopts Freedom of Information Law. 27.04.02: Letter to EU Convention. Answer. 24.04.02: Land Baden-Württemberg votes against freedom of information. 16.02.02: Letter to EU Council: Councils answer to Communication (93) 191. My confirmation of receipt. 02.01.02: To attract additional interest to freedom of information (described in my German page) this page was created to try to gain support of the European institutions and the European public. 27.12.01: Petition to the European Parliament. Addition 7. July 2002. Admission and conclusion: Improving the protection of the rights and interests of citizens of the Member States of the Union is listed in Article 2 as an objective of the Union. (see page 7/173 doc. A5-0318/2000). 23.06.01: The German ministry of internal affairs invited citizens to participate in an Internet Discussions. I welcome the plans of a freedom of information law for Germany, a chance to catch up with the international development. Albania, Argentina, Armenia, Azerbaijan, Australia, Austria, Belarus, Belgium, Belize, Bosnia and Herzegovina, Brazil, Bulgaria, Canada, Colombia, Council of Europe, The Czech Republic, Denmark, Eritrea, Estonia, European Union, Finland, Fiji, France, Georgia, Germany, Greece, Hong Kong, Hungary, Iceland, India, Ireland, Israel, Italy, Jamaica, Japan, Kazakhstan, Kyrgyzstan, Latvia, Lithuania, Luxembourg, Macedonia (FYROM), Mexico, Moldova, Mongolia, Nigeria, The Netherlands, New Zealand, Norway, Pakistan, Panama, Peru, The Philippines, Poland, Portugal, Romania, Russia, Slovak Republic, Slovenia, South Africa, South Korea, Spain, Sweden, Switzerland, Tajikistan, Thailand, Trinidad und Tobago, Turkmenistan, Uganda, Ukraine, United Kingdom, United States of America, Uzbekistan. Article 19 of the Universal Declaration of Human Rights given by UN. The International Covenant on Civil and Political Rights includes FOI in Article 19. Article 13 of the American Convention on Human Rights includes the right to seek information. The Inter-American Court of Human Rights Confirms Right of Access to Government Information 19. September 2006 in case Marcel Claude REYES et al. v. Chile Case No. 12.108:. Article 9 of the African [Banjul] Charter on Human and Peoples' Rights includes freedom of information. The Organization of African Unity is working on a Convention on Combating Corruption. The Commonwealth promotes FOI since 1980. The Commonwealth Human Rights Initiative campaigns the Right to Information. Article 10 of the European Convention on Human Rights includes Freedom of opinon and Freedom of Information. In 1981 the Council of Europe gave "Recommendation No. R (81) 19" on the access to information held by public authorities. A new Recommendation Rec(2002)2 was adopted 2002. 10. July 2006 the ECHR decides in case Sdruženi Jihoceské Matky v. Czech Republic, Application no. 19101/03 that Access to information is admissible. 11. April 2006 the ECHR decides in case GERAGUYN KHORHURD PATGAMAVORAKAN AKUMB v. ARMENIA Application no. 11721/04 to communicate the freedom to reveive information to Armenia. The EU Charter of Fundamental Rights gives a right of access to European Parliament, Council and Commission documents. right2info.org gives an overview on constitutional protection of the right to information: In Sweden - with longest tradition - FOI is found in the Constitution (Chapter 2, Article 1 (2)). The constitutions of many other countries i. e. Albania (Art. 23), Belarus (Art. 34), Belgium (Art. 32), Bulgaria (Art. 41), Croatia (only for journalists: Art. 38), Czech Republic (Charter of Fundamental Rights and Freedoms: Art. 17), Estonia (Art. 44), Finland (Constitution, Section 12), Georgia (Art. 41), Hungary (Art. 61), Lithuania (Art. 25), Macedonia (Art. 16), Moldavia (Art. 34), Netherlands (Art. 110), Poland (Art. 61), Portugal (Art. 268), Rumania (Art. 31), Russian Federation (Art. 29), Slovenia (Art. 39), Slovakia (Art. 26), Spain (Art. 105 b), Argentina (Art. 43), Kazakhstan, Kyrgyzstan, Malawi (Art. 37), Mongolia (Art. 16, 17), Mozambique (Art. 74), Nepal (Art. 16), Panama (Art. 42,43,44), the Philippines (Art. III, Sec. 7), Peru (Art. 200(3)), the Republic of South Africa (sec. 16), Tanzania (Art. 18(2)), Tajikistan, Thailand (Sec. 58), and Turkmenistan (26) all guarantee the right to access information held by the State. FOI laws came first to Scandinavia (Sweden (1766), Finland, Norway, Denmark and Island), then to English speaking countries (USA (1966), Ireland, England (UK)) and at last to German speaking countries (Austria (1986), Switzerland und Germany). FOI laws in other European countries are collected here. Germany still lacks Freedom of Information in 5 of 16 states as nearly the only major country in Europe. www.freedominfo.org the online network of freedom of information advocates with information about Germany. Access Info Europe is a human rights organization dedicated to promoting the right of access to information in Europe and contributing to the development of this right globally. 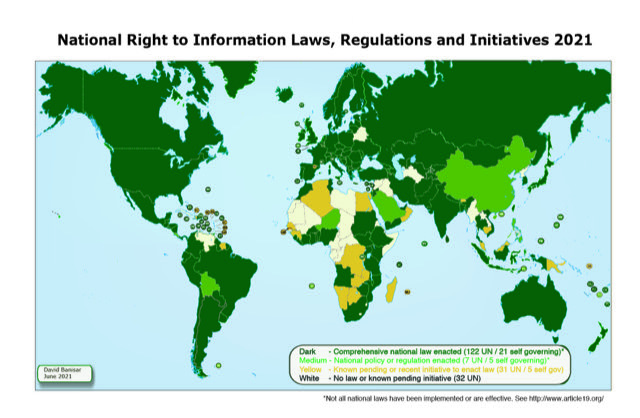 http://right2info.org: Right2INFO.org brings together information on the constitutional and legal framework for the right of access to information as well case law from more than 80 countries. www.justiceinitiative.org collected FOI Laws around the World. Freedom of information around the world collected from Privacy International is found here: http://www.privacyinternational.org/foisurvey with map. Freedom of Information in the European Union and Elsewhere of Christoph Sobotta: http://web.archive.org/web/20090303074245/http://user.uni-frankfurt.de/~sobotta/FOI.htm. Access to Information Lebanon: http://a2ilebanon.org/ offers an overview of resources. Freedom of Information came 1766 to Sweden, 1951 to Finland, 1966 to den USA, 1970 to Norway and 1985 to Denmark In 1981 the Council of Europe gave "Recommendation No. R (81) 19" on the access to information held by public authorities. A new Recommendation Rec(2002)2 was adopted 2002. Both EU and nearly all countries in the EU and Europe adopted such laws. However citizen rights vary and there are no minimum standards. In order to keep up with the international development freedom of information should be strengthened in EU member states. Here is a petition to the European Parliament. Freedom of Information came 1951 to Finland, 1766 (1949) to Sweden, 1966 to den USA, 1970 to Norway and 1985 to Denmark. In 1981 the Council of Europe gave "Recommendation No. R (81) 19" on the access to information held by public authorities. Germany is the only country in the EU without such a law. In order to keep up with the international development freedom of information should also be adopted in Germany. I support the call to the German Government for a democratic and accountable Freedom of Information Law on access to public documents. The Federal Republic of Germany is the only country in the EU without FOI. But 11 of 16 federal federal states (Bundesländer) Brandenburg, Berlin, Schleswig-Holstein, North Rhine-Westphalia, Bremen, Mecklenburg-Western Pomerania, Saarland, Hamburg, Thuringia and Rheinland-Pfalz have adopted FOI. Opposition parties in the states of Bavaria, Hesse, Lower Saxony, Saxony, Saxony-Anhalt have suggested FOI laws. Unfortunately parliaments in Baden-Württemberg, Bavaria, Hesse and Saxony have voted against FOI laws. I support the call to the German Federal State (Bundesland) Government for a democratic and accountable Freedom of Information Law on access to public documents. (This E-Mails is send to the parties governing the state, with a copy to the opposition suggesting the FOI law. You may change the text according to your needs). Thanks to all, who gave me this information. Please do not hesitate to mail me if you have additional information.